We offer poolside dormitory style accommodation just a few meters from the beach. 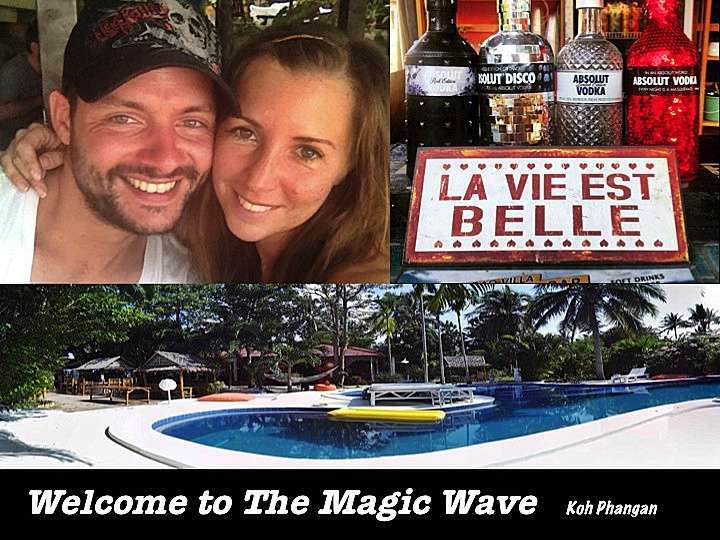 Guests can relax and enjoy the music from the bar whilst soaking up the beautiful sunshine of Koh Phangan. All dorms have a private bathroom with hot shower, AC, safety boxes and free wifi. Enjoy our bar and restaurant 'La Vie est Belle', we got sun, we got the sea and we got beer/wine/alcool/cocktails with thai or western food ! We provide for motorbikes and car rental, travel agency, party tickets, activities and excursions, towels and padlocks rental, taxi and laundry. We are located in the party zone (Halfmoon Festival/Blackmoon Culture/Shivamoon/Jungle Experience/Sramanora Waterfall only 10 minutes and Full Moon Party 15 minutes from The Magic Wave)...Enjoy the pre-party at the swimming pool every main event with dj's and glowing paints. If you need some rest, don't worry we are just far enough to get some good sleep and in the afternoon enjoy also our chill out area for 'la siesta'. The beach is very close, so why not learn or enjoy some Kiteboarding, The Magic Wave is located on the best coast of the island to do it and we can offer you some good advices to experiment that. -Directions from Thongsala: Travel East from main pier about 3km. When you pass Bangkok Hospital on the right 100 meters, we are on the left side of the street, direction beach. -Directions from Haad Rin: Travel West from main pier about 6.5km. Past the petrol station and 7/11 on your left for 60 meters, we are on the right, direction beach. A deposit will be asked to cover the price in case of lost or damage for the towel or keys.